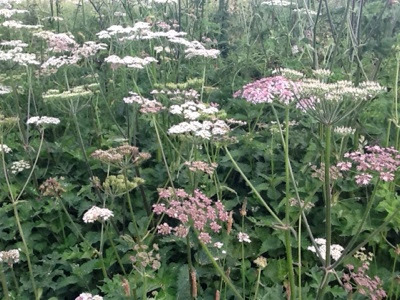 Cycled along one of my favourite local quiet country lane this morning and admired the profusion of what is probably hogweed. The verges haven't been cut yet and so the roadside was full of abundant growth. I love these umbellifer flowers and was struck by the different shades of colour from white to a murky pink. I am sitting in the earthen track of a local bridleway on a hot June day. This side of the hedgerow - a tall and unmanaged ancient double row of trees - is in the shade of the afternoon sun. I am looking at a patch of flowering nettles in front of me intertwined with goose grass, dock, hogweed, cow parsley, white dead nettle and a small bindweed. It is an area of about one square metre and my attention is caught by the sparkling silver trails left by snails all over the nettle leaves. With little effort I can easily count around 25 smalls, all about 5-15mm in diameter (probably white lipped snails and a few other species) and motionless in the summer heat. Once the night draws in they will probably start moving around to forage. I am amazed at how these small snails will happily move around the surrounding vegetation and will climb quite high over seemingly inhospitable surfaces to redt not just on broad leaves but to reach the ends of some distant stem too. It is interesting how 3-dimensional is the interaction between all elements of the ecosystem. Space is utilised in every direction and is quite different to how we humans interact with plants and animals around us. 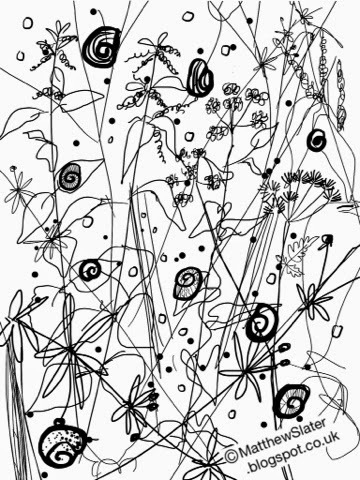 Whilst drawing the attached sketch I notice other things: a cranefly, tiny black leaf beetles on the cream umbellifer flowers, several scorpion flies, normal flies, a bumblebee, a tiny spider, a hover fly and the rustling of a mouse or other small mammal moving through the ground cover. It is amazing what you can find just by looking any patch of vegetation with a closer viewpoint and a few minutes to spare.